Citation Information: J Clin Invest. 2016;126(4):1181-1189. https://doi.org/10.1172/JCI81132. Exosomes and other extracellular microvesicles (ExMVs) have important functions in intercellular communication and regulation. During the course of infection, these vesicles can convey pathogen molecules that serve as antigens or agonists of innate immune receptors to induce host defense and immunity, or that serve as regulators of host defense and mediators of immune evasion. These molecules may include proteins, nucleic acids, lipids, and carbohydrates. 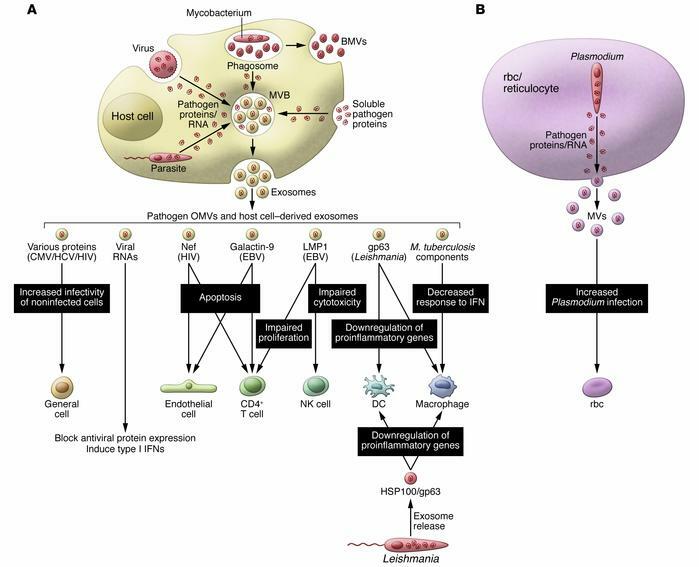 Pathogen molecules may be disseminated by incorporation into vesicles that are created and shed by host cells, or they may be incorporated into vesicles shed from microbial cells. Involvement of ExMVs in the induction of immunity and host defense is widespread among many pathogens, whereas their involvement in immune evasion mechanisms is prominent among pathogens that establish chronic infection and is found in some that cause acute infection. Because of their immunogenicity and enrichment of pathogen molecules, exosomes may also have potential in vaccine preparations and as diagnostic markers. Additionally, the ability of exosomes to deliver molecules to recipient cells raises the possibility of their use for drug/therapy delivery. Thus, ExMVs play a major role in the pathogenesis of infection and provide exciting potential for the development of novel diagnostic and therapeutic approaches. Inhibition of host immunity by exosomes and other ExMVs during the course of an infection. (A) Virus-, parasite-, and bacteria-infected cells release components that can be trafficked to MVBs and released on exosomes or the pathogens themselves release exosomes or microvesicles (MVs) and BMVs. These exosomes and other extracellular vesicles can inhibit an immune response and likely do so through multiple mechanisms acting on multiple cells. Examples include exosomes containing microbial molecules such as HIV Nef or Leishmania gp63, which can block T cell activation or induce apoptosis of immune effector cells. Exosomes from M. tuberculosis– or Leishmania-infected macrophages or from Leishmania itself can also limit the proinflammatory response in target macrophages and DCs. In contrast, exosomes from CMV-, HIV-, and HCV-infected cells can enhance the susceptibility of noninfected cells. (B) Similar results were seen with microvesicles from Plasmodium-infected rbc.